Vespers psalm settings by Victoria, Lassus and Rachmaninov have been mentioned several times on this blog – see for example Psalms 103, 104, 112, 116 and 127. 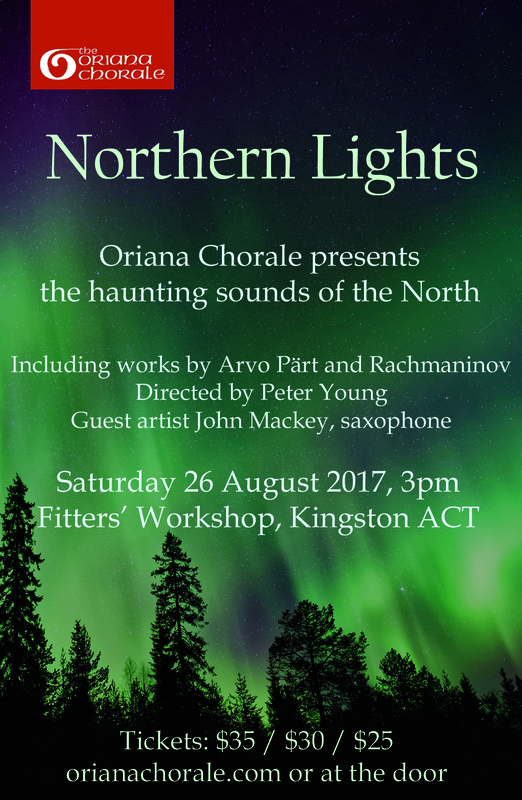 Canberra area readers will be interested in an opportunity to hear some of the wonderful Rachmaninov All-Night Vigil (‘Vespers’) this Saturday. Extracts from the Vespers will be performed in the extraordinary acoustic of the Fitters’ Workshop at 3 pm on Saturday 26 April 2017. The Oriana Chorale presents haunting music of darkness and light in a program of music composers of northern European descent, curated by Music Director Peter Young. The woman with the alabaster box is one of two works by Arvo Pärt, famous for his shimmering and hypnotic choral effects. Also included are works by three of the most interesting choral composers of today, Ola Gjeilo, Erik Esenvalds and Paul Mealor (the composer of a new piece for Prince William’s wedding). Jazz fans will also be interested to hear evocative saxophone improvisations by prominent local musician and teacher John Mackey.